In practical terms, OBDII is the complex web of sensors, computers and output devices that a modern technician interacts with, via scan tool, to begin the diagnostic process. However, would it surprise you that although it is a convenient interface for a trained technician, its primary purpose is something other than that? In an effort to create the cleanest, most environmentally friendly internal combustion engine possible, OBDII’s primary purpose is to ensure the vehicles engine is operating as emissions friendly as possible. The fuel system monitor is a program within the powertrain control module (PCM) that uses various sensors and output devices in an attempt to achieve stoichiometry – an air/fuel ratio that, when achieved, results in complete combustion. This is important because complete combustion is crucial to achieving exhaust emissions that comply with federal law. So how does the vehicle know how much fuel to add (or subtract) at any given moment to attempt to achieve such a precise ratio? Through the use of short term and long term fuel trims by the fuel system monitor, fuel delivery is adjusted based on changing variables such as engine load, RPM, temperature and atmospheric pressure, to name just a few. Understanding fuel trims is the gateway to diagnosing common emissions problems. However, before we begin to use this information, specific criteria must be met in order for the PCM to gather accurate information. Did We Meet the Enabling Criteria Yet? Under normal driving and operating conditions, the fuel system monitor must meet a minimum enabling criteria, which once satisfied, allows the monitor to run continuously, assuming the absence of diagnostic trouble codes (DTC’s) and the evaporative emissions purge solenoid is not actively purging hydrocarbons back into the intake. Additionally, the status of the oxygen (O2) sensors must be taken into account as well before proper fuel adjustment can begin to take place. Consult the vehicle service information for additional criteria that must be met. 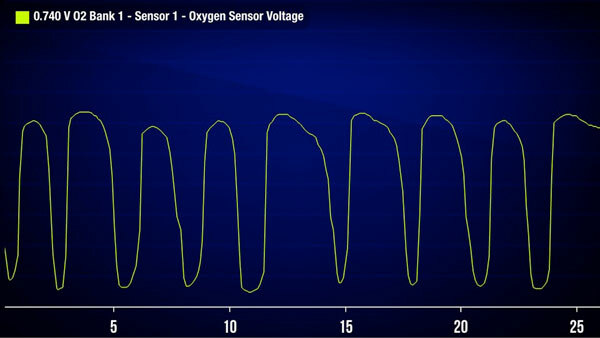 A standard O2 sensor sine wave. This represents a properly functioning O2 sensor. Are We in Closed Loop Yet? Closed loop refers to the operational status of the O2 sensor(s). If the O2 sensor has not risen to operating temperature, the vehicle is said to be in “open loop” and in turn will use a set of preprogrammed instructions (fuel maps) to determine fuel delivery. Once the O2 sensor is “live,” the fuel monitor is given the green light to use the O2 signal to adjust fuel delivery. This is referred to as “closed loop operation.” Only during closed loop operation can short and long term fuel trims be used to diagnose emissions concerns. This is short term fuel trim (STFT) at idle in closed loop operation. I’ve already mentioned that the purpose of the fuel monitor is to add or subtract fuel to achieve a stoichiometric air fuel ratio for emissions compliance. The only way the engine can vary fuel delivery is through the fuel injectors. It stands to reason that if the fuel monitor sees a lean condition based on O2 sensor readings, the immediate command would be for the fuel injectors to spray fuel for a longer amount of time. 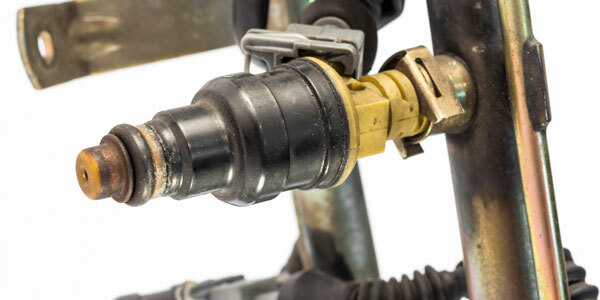 In a similar manner, if the fuel monitor sees a rich condition, the computer will compensate by limiting the amount of time the fuel injector is on. The amount of time that the fuel injector is held open allowing fuel to flow is known as injector pulse width. The fuel system monitor is in precise control over this. Great! But What About Those Fuel Trims? Let’s establish some ground rules! First, when viewing fuel trims on a scan tool, it is viewed as a percentage. The percentage shown (usually between +25% to -25%) is the amount of fuel being added or subtracted based on current conditions. This literally means that if the fuel trims are on the positive side, the fuel monitor is adding fuel to compensate for a lean condition. Similarly, if the fuel trims are reading negative, the fuel monitor is reducing fuel to compensate for a rich condition. Think of fuel trims as a window for the technician to see what the fuel injectors are doing. So What’s the Difference Between Short Term and Long Term? In practical terms, short term fuel trim (STFT) is the immediate response to a rich or lean condition by the fuel monitor. Long term fuel trim (LTFT) is a learned response based of the activity of the STFT. STFT is going to immediately react to a situation by adding or deleting enough fuel to correct the condition. The purpose of this immediate reaction is to bring the combustion chemistry back into stoichiometry as soon as possible. Once enough fuel has been added or deleted to correct the condition (as proven by the O2 readings), the long term will adjust itself to mirror the short term, thus establishing a new zero. 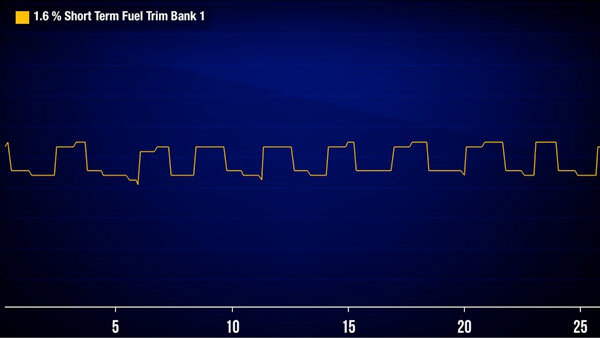 O2 sine wave overlaid onto STFT. Note how each works conversely of each other. When O2 reads lean, PCM commands STFT to increase injector pulse width to deliver more fuel. This is how the Fuel System Monitor attempts to maintain stoichiometry. This is a Little Confusing…Do You Have an Example? Imagine you have a vehicle in your garage that seems to be running without issue. In a perfect world, the STFT would read 0%, LTFT would read 0%, and O2 sensor would be fluctuating rhythmically between 0.1v-0.9v. While its running, you accidentally disconnect a vacuum line, creating a small vacuum leak. 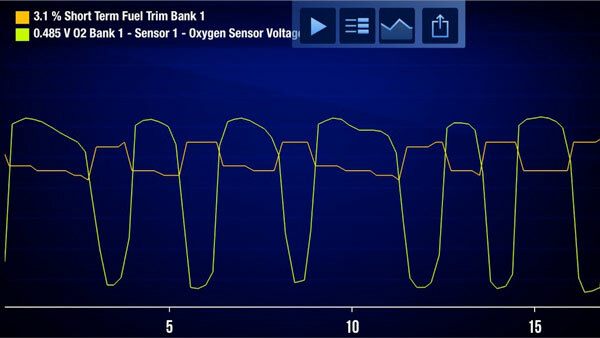 Because air is now entering the engine at the point where the vacuum line was disconnected, the O2 sensor sees this and reports a lean condition. The fuel monitor sees this lean condition, and immediately tells the STFT to begin to add fuel until the O2 sensor begins to read normal again. So, as an example, let’s say the STFT begins to add fuel until it reaches +13%, when at that point, the O2 signal returns to normal. Since the O2 is now reading normal, the STFT no longer needs to increase fuel delivery, and begins to level off (at +13%). At this point, LTFT has been looking at what the STFT has done, and now that short term has leveled off, LTFT begins to increase to +13%. Once long term reaches +13%, it now levels off, and the fuel monitor establishes +13% as the new baseline. Since this is the new baseline and everything has been compensated for, STFT does not have to make any further corrections, so it begins to fall back to 0% (remember, STFT is only there to make immediate corrections, not solve the problem. Once LTFT took over, STFT was no longer needed). At this point, if a technician were to take fuel trim readings from the scan tool, they would read STFT 0%, LTFT +13%, O2 .1v-.9v. Suddenly, you realize what you had done, and reconnect the vacuum line. At this point you have stopped the leak, so the engine is back to receiving the amount of air it originally needed to maintain stoichiometry. However, the LTFT is still adding +13% more fuel, so now you have just created a rich condition! Well, the O2 sensor sees this rich condition, and immediately reports this to the fuel monitor. The fuel monitors response is (you guessed it! ), to tell STFT to immediately reduce the amount of fuel by decreasing the injector pulse width. So now the STFT begins to decrease fuel, and eventually gets to (you guessed it again!) -13%.Once it reaches -13%, the O2 sensor again starts to read normal, and STFT begins to level out at -13%. Now, LTFT (which at this point is still at +13%, because it still hasn’t moved from when it was compensating from the original vacuum leak), sees that since STFT has leveled out after reducing fuel by 13%, so it too will do the same and reduce itself by 13%, bringing it back to 0%. At this point, the problem has been solved and the fuel monitor is back to its original readings. I hope you enjoyed this very brief introduction to fuel delivery. Understanding fuel trims, O2 readings and fuel monitor operation goes far beyond what can be learned in one article. Engine RPM, DTC’s, and MIL status are just a few other factors involved in using fuel trims as a diagnostic tool. However, building a proper foundation is the first step. My intention as an instructor (and technician) is for this article to build the confidence and interest to continue to explore this subject. Please feel free to contact me with any questions you may have or advice on some great resources.